Engineer Your World, a high school engineering curriculum and teacher support program operated by UT Austin and developed by experts in the Cockrell School of Engineering, has been named an “Accomplished Program” by STEMworks and selected by the Iowa Governor’s STEM Advisory Council as one of 10 “Scale-Up Programs” to be offered in Iowa-area high schools beginning this fall — two national distinctions that illustrate the program’s extraordinary growth since its launch in 2008. 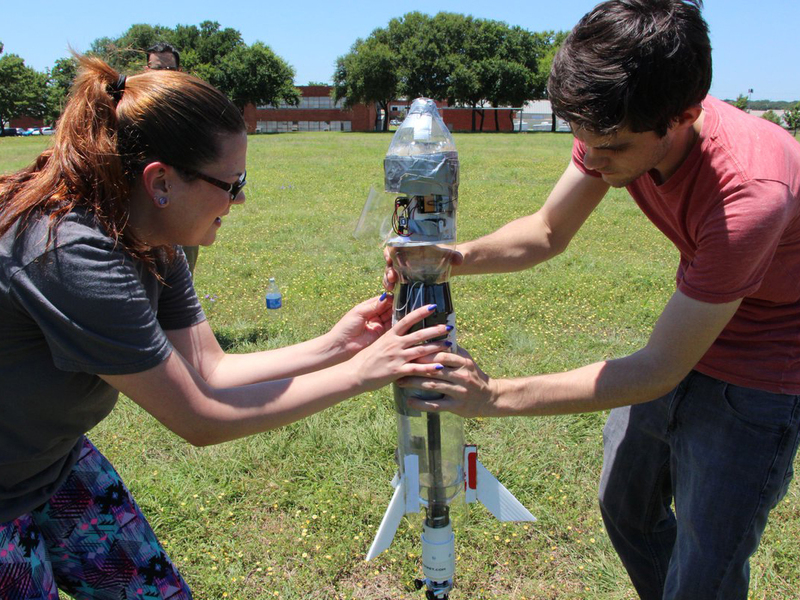 Students in an Engineer Your World class test their water rocket design. 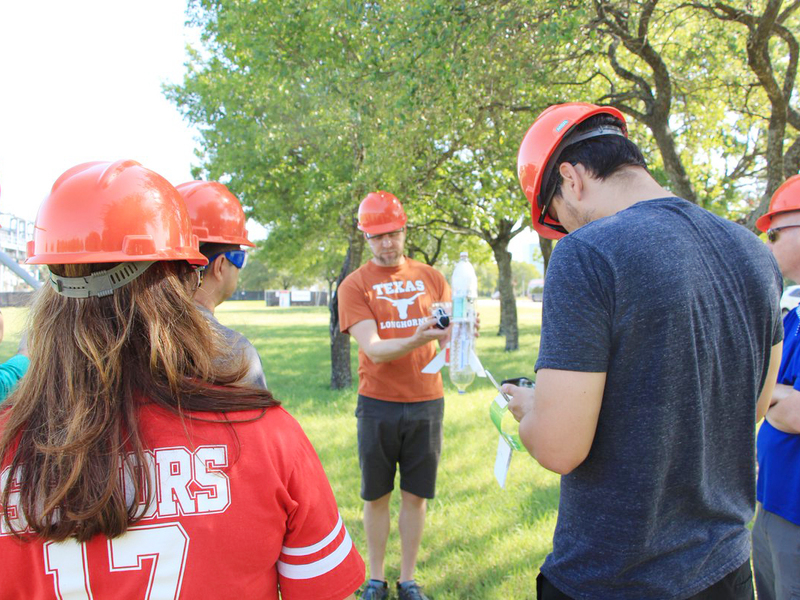 Developed and introduced with the help of a $12.5 million grant from the National Science Foundation, Engineer Your World is an innovative curriculum designed by faculty in the Cockrell School and UT’s College of Education in collaboration with industry professionals, NASA engineers and secondary education specialists. It provides teacher training, support programs and comprehensive instructional materials focused on engaging high school students in hands-on engineering experiences. Initially serving 212 students, seven schools and one state, Engineer Your World has now grown to serve over 10,000 students and 250 schools across 26 states, even extending overseas as far as South Korea. 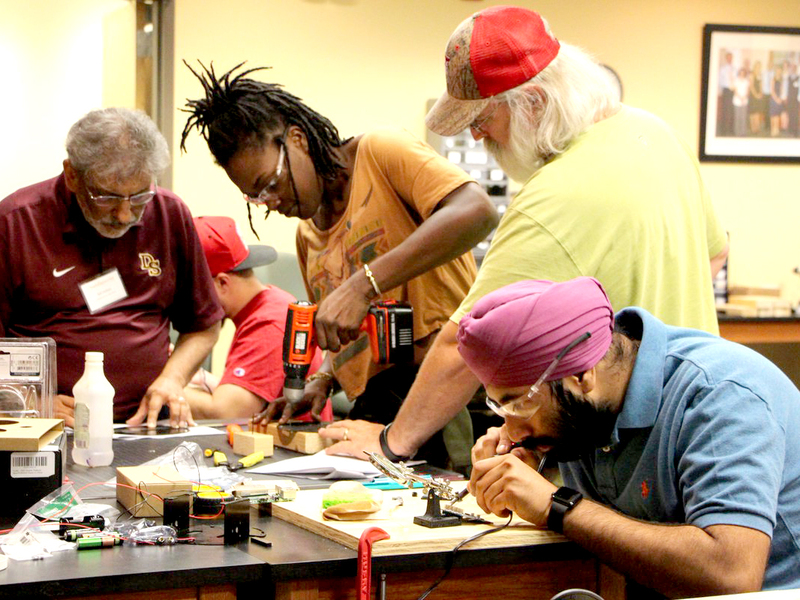 Teachers learn engineering principles in the teacher training program that prepares instructors who will be teaching Engineer Your World courses in their high schools. This year, the curriculum was recognized by STEMworks, an organization that identifies the most effective STEM education programs in the country. Each program is assigned one of three ratings — Undeveloped, Developing or Accomplished — that help companies, states and individuals invest in the right programs. Only the top programs are awarded the “Accomplished” title, an honor that places Engineer Your World in a category reserved for a select few. In addition, the Iowa Governor’s STEM Advisory Council selected the program as one of 10 “Scale-Up Programs” that will be offered in Iowa-area high schools during the 2019-20 academic year. Formed in 2011, the council works to increase STEM education opportunities for students from pre-K through high school. Educators can apply for the opportunity to implement one of the chosen Scale-Up Programs, and the council will cover the curriculum license for one year along with associated teaching materials and professional development opportunities for chosen educators. Both organizations recognize Engineer Your World for its ability to engage aspiring engineers in STEM-based learning experiences and inspire students to embrace an engineer’s thought process. Learn more about Engineer Your World.